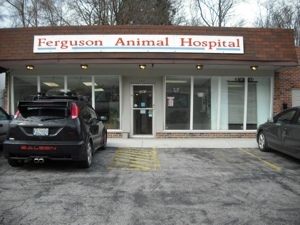 Ferguson Animal Hospital began here in Ferguson, Missouri more than 40 years ago. Drs. Dan and Julie Wentz purchased the practice from Dr. Goman in 1993. The next year they moved from 501 Airport Road to the current location at 483 Airport Road. Our goal is to treat our clients as we would treat our families, and to treat their pets as though they were our own. Our clients and patients are the heart of our practice and the reason we are here every day. At all times our clients and patients will be treated with respect, dignity, and compassion. Being of service to our clients and patients is the definition of our purpose and the mission of our practice. To accomplish this we provide a trained and professional staff, modern equipment and technology, concern for our patients' health and well being, and a genuine concern for our clients' time. We hope through this philosophy that our clients are highly satisfied with the personal care of their pets, continue as a life-long part of our practice family, and enjoy long lasting health for their pets. We accept VPI Pet Insurance.